Social media gives us the ability to connect brands directly to their customers. Social platforms like Facebook are great channels through which you can interact with your audience, and tailor content to meet their current needs or interests. But to make sure all this interaction and social engagement is worth it, you need to drill down to what details really produce the results you’re seeking and continually optimize for those. This is why reviewing Facebook Audience Insights and the vast amount of user data the social network offers is so important. 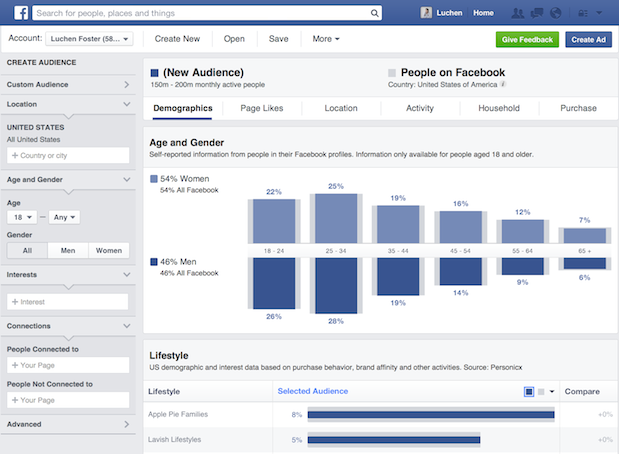 So, to help you on your dive down into the social data abyss, here’s how to use Facebook Audience Insights to improve your targeting. The more you know about your users, the better you can target them with content tailored to their preferences. The end result is more engagement on your ads and a much better ROI. 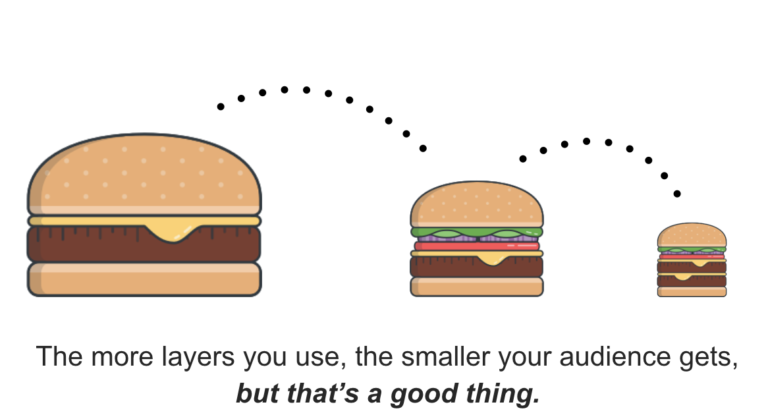 The more of these data points or layers you use to refine your audience, the smaller it will become. 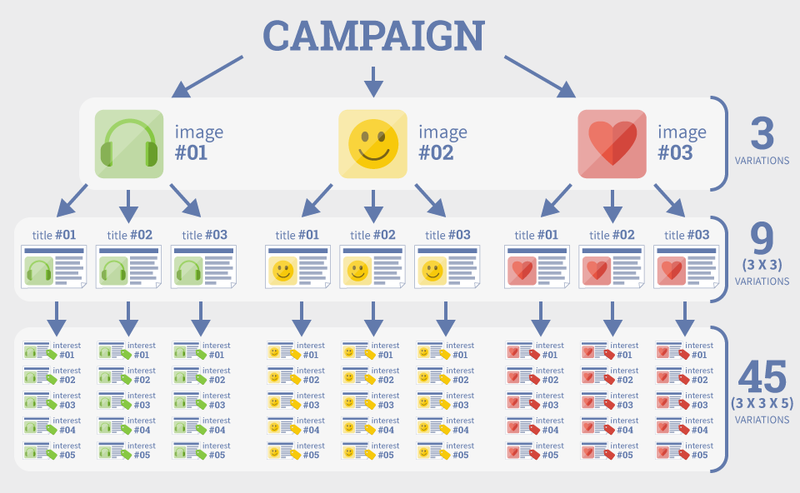 However, your campaign will be much more targeted to a specific user. As long as you don’t jump the gun and add too many layers before having some data to back up doing so, this could be beneficial in a few different ways. For instance, your ad spend should be lower, because you’re targeting a smaller audience and not driving unqualified engagements. Basically, this helps lower your cost per action (CPA). Not only that, it also helps you expand your successful audiences. So, even if you’ve found an audience that works well for you, you can use Audience Insights to find more related interests and topics to help scale your campaign. Having touched briefly upon the benefits of using Ad Manager to create more targeted audiences, we’ll move on to an actual walk-through of some options you have for doing this. The Audience Insights Tool will help you segment your defined “seed” audience based on different preferences and demographic details. If you’re looking to test new waters within your audience and try out some new content or offers, this is a great resource to tap in terms of what trends and topics might interest your audience. Depending on what campaign you’re running, you’ll want to pick different options. For example, if you have an email list you want to use for remarketing, you can create a custom audience from that. On the other hand, if you’re looking to boost social conversions for your current followers, you’ll probably want to target users connected with your page. Then, start by using the sidebar to refine your audience based on the basic parameters of your audience. Things like age range, country, gender and other basic stats will be included here. Once you’ve looked through dimensions of some of your more successful ad campaigns, you can really start to layer your targeting to get specific with who you’re reaching by clicking through to the “Advanced” drop down menu. 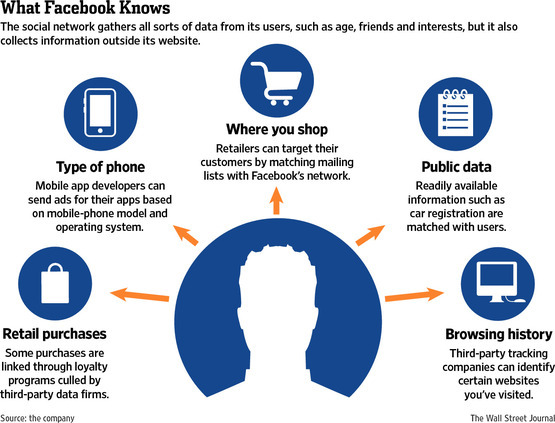 Essentially, this is where you can get real creepy with your user targeting. And don’t worry, that’s a good thing. At this point, many have accepted the internet knows all and sees all. Remember the user agreement and terms you clicked to accept without reading? Now the Audience Insights tool will start going to work for you on this new targeted audience to show you what they’ll find the most interesting, or perhaps not so interesting. If you navigate to the Page Likes tab (just to the right of Demographics) you’ll be able to see a the Top Categories for which your audience will most likely engage. This offers powerful insights in and of itself, but the Audience Insights tool doesn’t stop there. It will also show you which pages within these categories users have liked, which helps you tailor your content and campaigns to their preferences. For example, if you were to see in Audience Insights the Top Categories shows you that your users follow dietary and wellness pages, you can create content around the newest health trends for 2018 to really engage with your audience. 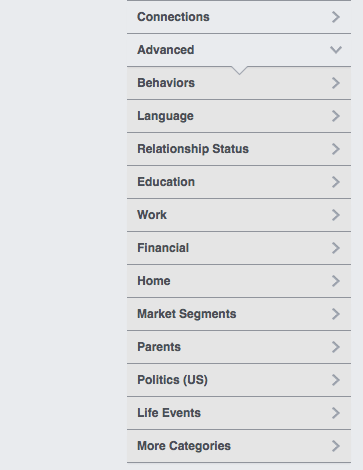 Of course, this is just a simple list of suggestions that Facebook is generating for your new audience. It would be really great if there was some actual data in regards to their relevance, or something, right? If you scroll down a bit within the tool, you’ll actually see a list of pages ranked by their relevance and affinity. These two terms are very closely intertwined within the Ad Manager, but understanding the difference between the two can be very helpful. The Pages that are the most likely to be relevant to your audiences based on affinity, Page size, and the number of people in your audience who already like that Page. How likely your audience is to like a given page compared to everyone on Facebook. The big difference here is that relevance is somewhat determined by affinity. Because relevance is determined by affinity and the number of people in your audience who already like the page, there can be some overlap. Basically, if you see a page with a high affinity, it’s very likely people in your audience will like that page, or have liked it already. 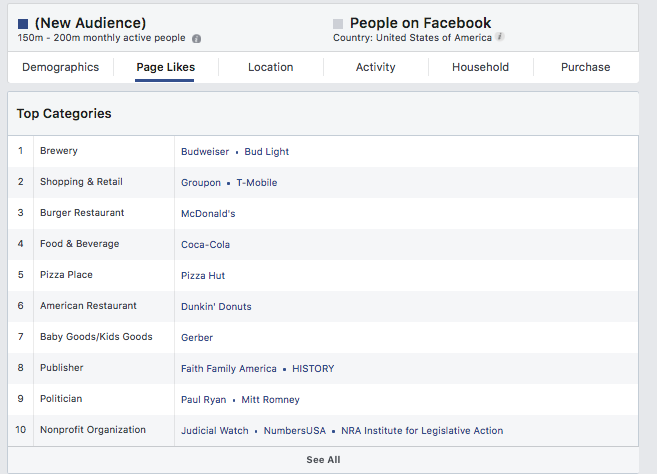 If you’re going for likes in the campaign that you’ve created this new audience for, this is a great source of helpful data you can use. By knowing which pages have the highest affinity for your new audience, you can tailor your own pages and Facebook ads to cater to these users’ preferences. You don’t just want your content to be relevant to users. You want it to engage them and generate likes, follows and hopefully conversions. This is why affinity is such an important metric instead of just going off of Facebook ranking pages by relevance. 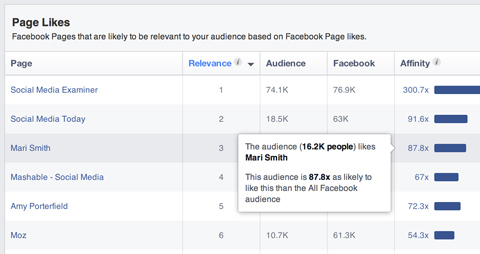 By using relevance and affinity within Audience Insights, you can start to do some quick testing in your organic Facebook efforts before your paid campaigns start spending the big bucks. 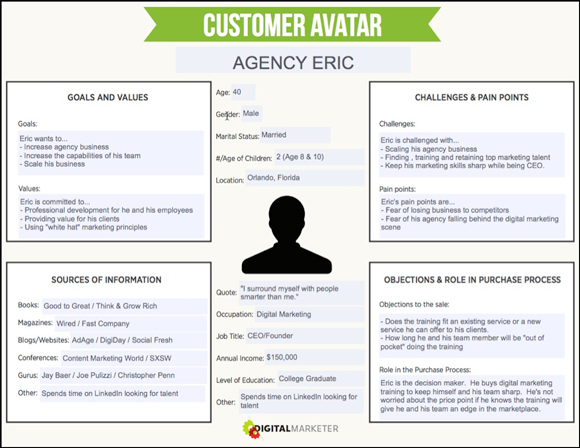 You probably have some general avatar or profile of your ideal customer. It hopefully at least includes details like age range, location, goals/values, company size, job role and pain points. The Audience Insights tool allows you to add to this ideal customer profile. And with some quick organic Facebook tests, you ensure that your paid campaigns start off on the right foot by targeting the exact customers you’re most confident will convert. Let’s consider an example. You’re running a Facebook brand awareness campaign looking to generate likes and follows of your branded Facebook page as well as remarketing campaign to generate conversions for your product (we’ll say you sell art and sketch supplies). The recent release of a new animated Miyazaki movie is trending all over Facebook, so you decide to do some research. By selecting your own Facebook page as the “connected to page” option and then entering Miyazaki films as the interest, you see what the distribution for certain pages looked like for your remarketing audience. Due to the new movie release, you may see an increase in affinity towards Miyazaki-focused Facebook posts. So, to capitalize on the trend, create a quick organic Facebook test to see how your audience engages something based on Miyazaki’s use of art in his artistic animation of the film. This is a simple blog post or Facebook post you can publish organically. Without any ad spend, you still get quite a great deal of feedback from this post by comparing it’s engagement to your usual posts. 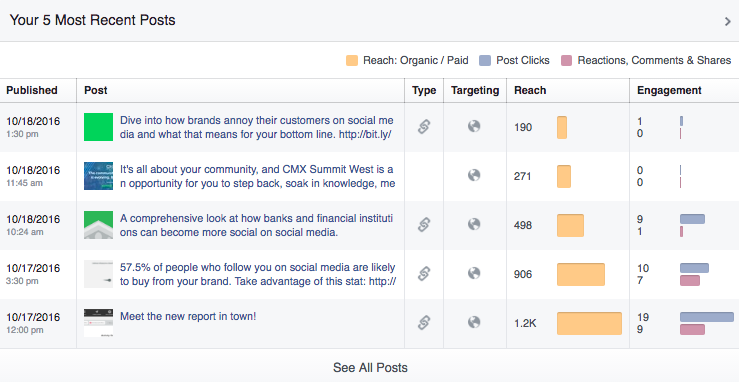 For this, you’d have to click through to your Facebook Business Manager to look at your post engagement. Hopefully, you’d see that this new blog post is outperforming your ordinary posts. This would prove your trend hypothesis correct; that users are (at least for now) highly interested in art or sketch supplies due to the new animated movie release. This is a huge discovery that you’d otherwise miss without the Audience Insights tool. Now, you can create an actual Facebook remarketing ad toward your custom audience that leverages the trending film. This should not only engage your new audience at a higher rate, but should also generate more conversions. By using the Audience Insights tool to create customer profiles in this level of depth, you learn how to better tailor your content to your users as well as where to promote your content to ensure they read it. Now that’s a big win. Social media marketing is the realm where stalkers are true victors. The more you learn about your user—what they like, where they spend their time online or what interests link them to your product—the more you customize their experience with your brand. In an age where the majority of customers prefer a more personalized brand experience (especially with digital), this makes all the difference. Make sure you’re leveraging Facebook for the data powerhouse that it is, and use Audience Insights to test and narrow your audience to perfection. It may go against the cliche, but in Facebook, the smaller your audience, the greater the odds of you hitting your target. But the key is to make it relevant. Johnathan Dane: Johnathan Dane is the Founder of KlientBoost, a PPC agency focusing on CRO and aggressive testing. He has grown two separate agencies to more than $5M in annual revenue in less than three years.